Mac Fisher, Bruce Athman, Steve Halpin, Bob, all From Hannibal, MO, Al Durand from Palmyra and Tom Wooten from New London, MO were all fishing at Fireside Lodge for their first time. 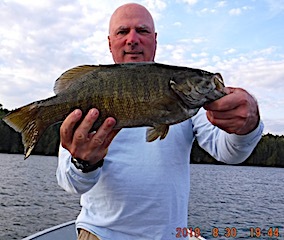 1st evening both Steve and Mac landed BIG Smallmouth Bass 17+inches. 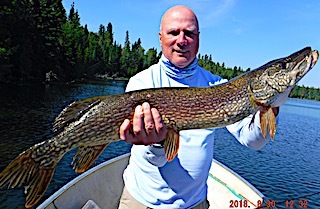 1st full day of fishing was full of action with Steve & Mac catching 15+ nice Northern Pike on what had become a magic lure from my tackle shop, all purchasing at least two each. 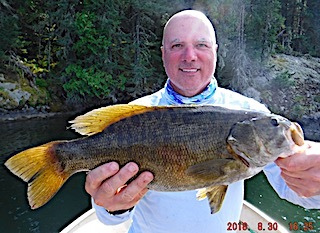 Bruce and Tom did very well on Smallmouth Bass with Bruch catching a 17, 17.5, and an 18-inch Trophy Smallmouth Bass while Bob and Al also did well on a mix of Pike and Smallmouth Bass. 2nd day was very good for some even though they fished in miserable rainy cold front conditions with strong winds. 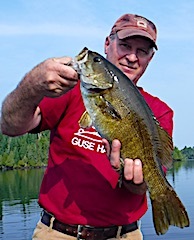 Steve and Bruce seemed to do the best catching 15 Northern Pike and some nice Smallmouth Bass 16 to 17.5-inches and Bruce caught his 2nd Trophy 18-inch Smallmouth Bass. 3rd day these guys just kept rolling along catching many Smallmouth Bass and Northern Pike, Steve catching a 17, 17.5 and 18.5 inch Trophy Smallmouth Bass along with several 30+inch Northern Pike. Bob said his boat did very well again catching Smallmouth Bass and Northern Pike on his new favorite plastic bait, The Ned Rig, and Mac caught the biggest fish of the group in all the years they have been fishing together and for his life a Muskie that absolutely filled our 48+Inch cradle, both him and Bruce saying it was every bit of 50-inches. It took both to lift the Muskie into the boat and with great concern about releasing the fish back to the water they opted for not taking any pictures to ensure the fishes survival, which took about 5 minutes, but it did swim away vigorously. 4th day they all caught fish with some doing better than others but as a group they had a good day. 5th and final day was beautiful weather and they all did well catching fish. Before departing they all mentioned what a great time they had and really enjoyed all aspects of their trip at Fireside Lodge. 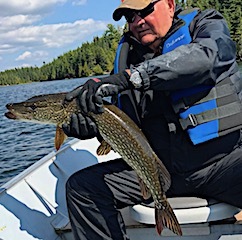 Fireside Lodge Long Timers Greg Benton, Randy Genord and his son Ryan from Grand Blanc, MI were back to comb the waters of Little Vermilion Lake for monster Toothy critters. 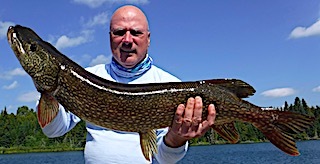 DOA Ryan set the bar right away landing a very large bodied 38-inch Northern Pike. 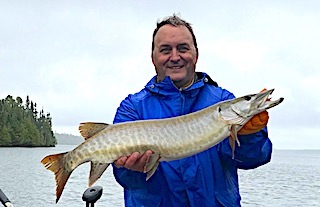 Severe cold front conditions on day one did not stop these three from catching some nice 30-inch plus Northern Pike and Randy caught a nice 32-inch Muskie. 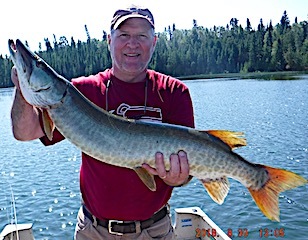 That evening after supper all caught more Pike and Randy caught a 36-inch Muskie that looked like it was bulging from the seams. 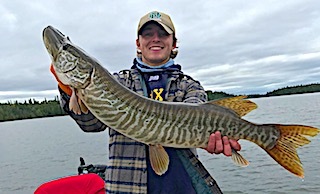 Day 2 they were fishing in after cold front conditions so expectations were not high, but it was Ryan who came up with the fish of the day landing a very large very heavy 38-inch Tiger Muskie. 3rd day had Ryan again being the center of conversation as he had a HUGE Muskie on, and after fighting it for a while, he got the fish up to the boat and in the netting process a hook got hung up in the net with the fish half in and half out. This situation never turns out well and this was no exception as the fish flipped dislodging the hook in splashing back into the water and swam off. Ryan was disappointed and Randy felt horrible but that’s fishing. 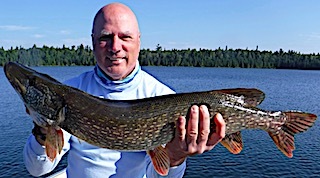 Beside that event they all caught some nice Northern Pike. 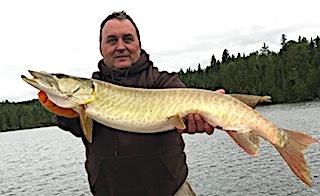 4th day Randy and Ryan did very well again with Ryan catching a fat 36-inch Muskie on the same lure he has been catching all the bigger fish on named the Krave. 5th and final day was planned as half day fishing as they wanted to be on the road by 4PM, catching some Northern Pike before being chased in early by some thunder and lighting. All left having a fabulous stay hoping to return in 2019. Dave & Phyllis Hancock from SC were visiting Fireside Lodge for their first time. 1st day they were met with sever cold front conditions and opted to stay in for the day but were rewarded seeing a Lynx walking across our lawn in search of a meal. 2nd day was great catching 15+ nice Smallmouth Bass, Dave landing an 18.5-inch Trophy, and about 8 Northern Pike up to 30-inches. 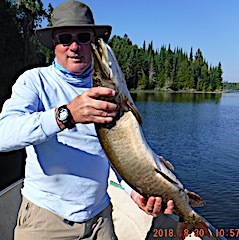 Very good for their first day ever on Little Vermilion Lake during post cold front conditions and this was all accomplished within 5-7 minutes from the lodge. 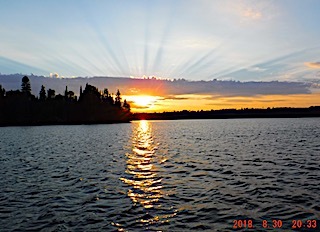 3rd and final day, boy 3 days goes fast, they had an even better day fishing and Phyllis said it was so beautiful fishing in the wilderness atmosphere mother nature gives us at Fireside Lodge. They also met some wonderful people and had great conversation at suppertime in our dinning room. Both left saying they really enjoyed their first visit to Fireside Lodge. Bill Browne from Minneapolis, MN and Matt Bachinski from Ninety Six, SC arrived for their first experience fishing at Fireside Lodge. DOA they did well catching some BIG Smallmouth Bass within just a few hours of arriving, Matt catching some in the 17-inch range plus landed a 18-inch Trophy. 1st full day they were graced with a Classic Canadian Cold Front going from 80 degrees and humid to a high of 55 degrees, low of 43, with rain and wind. They did well for such difficult conditions and being first timers on Little Vermilion Lake as they caught over 20 fish mostly nice size Northern Pike along with a few Smallmouth Bass and Matt landed his 2nd Master Anglers Award Smallmouth measuring 19.5-inches. 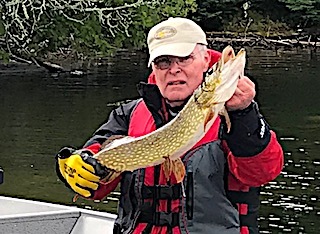 2nd day they were facing post cold front conditions catching a lot of fish with Pike up to 30-inches and Smallmouth Bass in a variety of sizes. 3rd day Bill was Muskie fishing while Matt was using plastics trying to pick up Smallmouth Bass in the weeds. Well both were successful with Bill having a very good day catching bigger Pike while seeing some Muskie having one very BIG Muskie follow, and also having the opportunity to hook a very large Muskie which took his drag screaming so fast he thought he was fishing salt water, only to have the hook pop out on the final run. 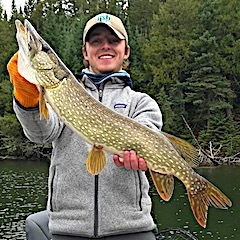 Matt also did well searching for Smallmouth Bass with the Ned Rig catching many fish including some bigger Northern Pike. 4th and final day was a super finish for these two catching a lot of BIG fish. Bill ended up with Northern Pike of 31, 33, 36, and a Trophy at 41.5 inches, a 36-inch Muskie, and his first ever Trophy Smallmouth Bass catching two at 19.5 inches and Matt had the biggest Muskie he ever caught measuring 40.5-inches. WOW what a special big fish day both saying is was their best day ever catching large fish. Both thrilled with their stay and upon departing said they will be contacting us in several weeks to reserve their dates for 2019. Make sure to go to our website below to see some GREAT Fish Photos. For Fabulous Fishing Video, Wildlife Events, and Current Happenings go to our Social Sites From Our Websites Below. 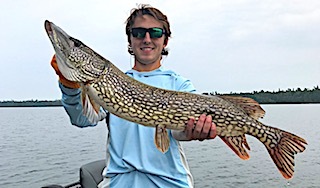 Catches of The Week: 41.5, two 40.5, 39, several 38 –inch Northern Pike, 38-inch Tiger Muskie, 40.5-inch Musky, and many Smallmouth Bass 18-19.5-inches.